A vacuum arc melter fabricating NiTiHf HTSMAs, a new smart material with many potential applications. Image: Texas A&M University Newswire. "What excites me is that we have just scratched the surface of something new that could not only open a completely new field of scientific research, but also enable new technologies," said Ibrahim Karaman, head of the university's Department of Materials Science and Engineering. The work is reported in a paper in Scripta Materialia. Karaman's co-authors are Demircan Canadinc, William Trehern and Ji Ma of Texas A&M, and Fanping Sun and Zaffir Chaudhry of the United Technologies Research Center (UTRC). Their discovery is based on bringing together two relatively new areas of materials science involving metal alloys, or metals composed of two or more elements. The first area involves shape-memory alloys, ‘smart’ materials that can switch from one shape to another in response to specific triggers, in this case temperature. Picture a straight metal rod that is bent into a corkscrew. By changing the temperature, the corkscrew can turn back into a rod and vice versa. Many potential applications for shape-memory alloys involve extremely hot environments like a working jet engine. Until now, however, economical high-temperature shape-memory alloys (HTSMAs) have only worked at temperatures up to about 400°C. 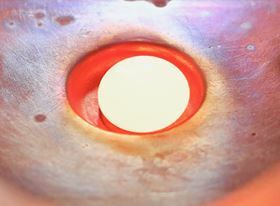 Adding elements like gold or platinum can significantly increase that temperature, but the resulting materials are much too expensive, among other limitations. While working on a NASA project with UTRC and colleagues, Karaman began this current research to address a specific problem: controlling the clearance, or space, between turbine blades and the turbine case in a jet engine. A jet engine is most fuel-efficient when the gap between the turbine blades and the case is minimized, but this clearance has to have a fair margin to deal with unusual operating conditions. HTSMAs incorporated into the turbine case could allow the minimum clearance to be maintained across all flight regimes, thereby improving thrust-specific fuel consumption. Another important potential application of HTSMAs is the reduction of noise from airplanes as they come in to an airport. Planes with larger exhaust nozzles are quieter, but less efficient in the air. HTSMAs could automatically change the size of the core exhaust nozzle depending on whether the plane is in flight or landing. Such a change, triggered by the temperatures associated with these modes of operation, could allow for both more efficient operation while in the air and quieter conditions at touchdown. Karaman and his colleagues decided to try increasing the operating temperatures of HTSMAs by applying principles from another new class of materials, high-entropy alloys, which are composed of four or more elements mixed together in roughly equal amounts. The team created materials composed of four or more elements known to form shape-memory alloys (nickel, titanium, hafnium, zirconium and palladium), but purposefully omitted gold or platinum. "When we mixed these elements in equal proportions we found that the resulting materials could work at temperatures well over 500°C – one worked at 700°C – without gold or platinum. That's a discovery," said Karaman. "It was also unexpected because the literature suggested otherwise." How do the new materials work? Karaman said they have ideas for how the materials operate at such high temperatures, but do not have solid theories yet. To that end, future work includes trying to understand what is happening at the atomic scale by conducting computer simulations. The researchers also aim to explore ways to improve the materials' properties even further. Karaman notes, however, that many other questions remain. "That's why I believe this could open a completely new area of research," he said. "While we will continue our own efforts, we are excited that others will now join us so that together we can push the boundaries of science." This story is adapted from material from Texas A&M University, with editorial changes made by Materials Today. The views expressed in this article do not necessarily represent those of Elsevier. Link to original source.